Edited by Ginee Seo for Ginee Seo Books. A science fiction novel for ages twelve and up. Feed meets The Giver meets The Secret of NIMH in a breathtaking novel from an award-winning fantasy author. The ads had started running on midmorning television the summer after Martin's fourth birthday. "Wonder babies are here!" they announced. ... Never had the arrival of the stork brought such excitement. Overflowing with charm and intelligence, Wonder Babies were like nothing the suburb had seen before. But that didn't turn out to be a good thing. Martin lives in a perfect world. Every year, a new generation of genetically-engineered children is shipped out to meet their parents. Every spring the residents of his town take down the snow they've stuck to their windows and put up the flowers. Every morning his family gathers around their television, and votes, like everyone else, for whatever matter of national importance the president has on the table. Today, it is the color of his drapes. It's business as usual under the protective dome of suburb HM1. And it's all about to come crashing down. Because a stranger has come to take away all the little children, including Martin's sister, Cassie, and no one wants to talk about where she has gone. The way Martin sees it, he has a choice. He can remain in the dubious safety of HM1, with danger lurking just beneath the surface, or he can actually break out of the suburb, into the mysterious land outside, rumored to be nothing but blowing sand for miles upon miles. Acclaimed author Clare B. Dunkle has crafted a fresh and fast-paced science-fiction thriller, one that challenges her characters—and her readers—to look closer at the world they take for granted. Buy THE SKY INSIDE in hardcover. 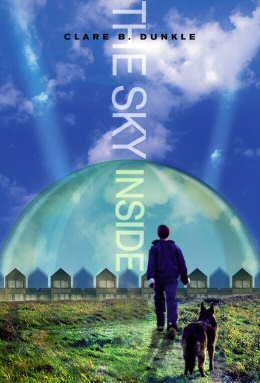 Buy THE SKY INSIDE in Kindle edition. Included in the 2011 Grand Canyon Reader Award list. "Many children will identify with Martin's characterization as someone who hates academics but '[knows] the stuff that matters,' and most will envy his robotic-dog sidekick ... This entertaining, provocative novel invites middle-grade readers to ponder looming questions about scientific ethics, human rights, and the push-pull between security and freedom." Listed in Booklist's Core Collection: Dystopian Fiction for Youth. "Part coming-of-age story, part thriller, the novel leads readers on an exciting adventure through a grim future." Featured as the cover of American Library Association's Booklist magazine. "Successfully explores the dangers of despotism and the role that an uninformed citizenry can have in furthering oppression. Middle grade readers will connect readily with the well-written character of Martin, whose sensitive portrayal evokes a message of hope and optimism." CLICK HERE FOR A HIGH RESOLUTION BOOK JACKET IMAGE. Jacket art copyright 2008 by Sammy Yuen, Jr. Book excerpt may or may not appear on printed book jackets. Book excerpt copyright 2008 by Clare B. Dunkle. Text and image courtesy of Simon & Schuster Children's Publishing Division. All webpage text copyright 2003-2014 by Clare B. Dunkle, unless attributed otherwise. All photos copyright 2003-2014 by Joseph R. Dunkle, unless attributed otherwise. You may make one print copy of any page on this site for private or educational use. You may quote the author using short excerpts from this website, provided you attribute the quote. You may use the photos in both print and virtual media to promote the author's books or events. All other copying or use of this website material, either photos or text, is forbidden without the express written consent of the author.